This hike will take you from Toroni (or your can start from Porto Koufo) to the most southern point on Sithonia. You will get to see the majestic harbour of Porto Koufo which is more like a fjord and the deepest natural harbour in Greece. The tour will then take you to some beaches that are difficult to access, so few people ever go there. First on the way is Marathias beach followed by Lemos beach on the tip. It’s not a difficult walk, but the distance is enough to be a long day if you stay to enjoy the beaches. Heading south, follow the main road towards Porto Koufos. It will take about 30 minutes to reach Porto Koufos. Walk along the main beach and join the main road towards Kalamitsi. After about 500 meters there is an unpaved road turning right. Follow this road past a reservoir on your right, and continue for another 2 km and you pass some houses on the right. Go down until you reach Marathias beach. Except for a few boats that may be docked in the bay, few people come here. Head back on the road you came from. After passing several houses you see a trail going to the right. Follow this trail down a steep hill until you reach Lemos beach. There are actually two beaches on either side of a causeway leading to the point. From Marathias to Lemos is about a 3 km stretch. 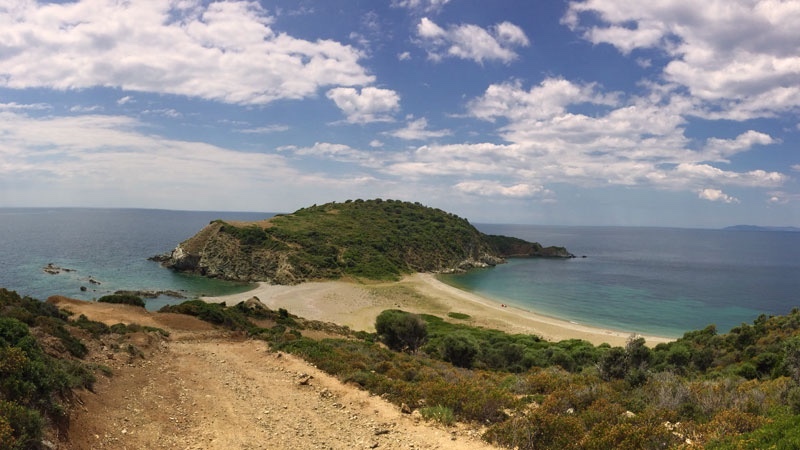 Continue through the causeway to the tip of Sithonia for about another 500 meters.